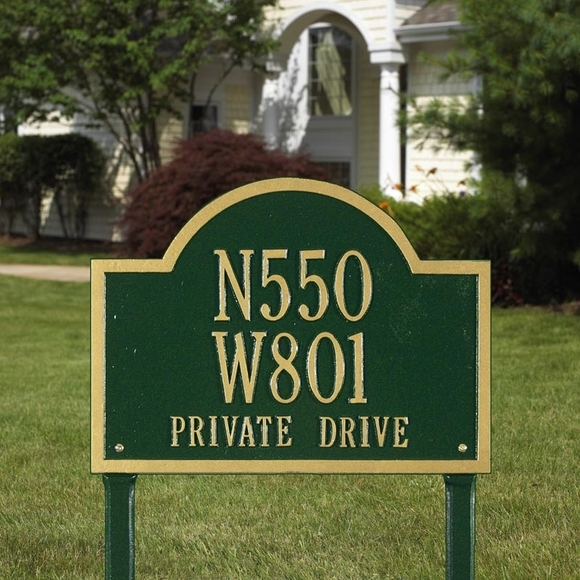 Personalized Wisconsin Special Address Plaque - - special format address sign made in the USA by Whitehall Products. Two line or three line arch available for wall mount or lawn mount. The two-line version holds up to eight 3" characters (including spaces) on line 1 and up to eight 3" characters (including spaces) on line 2. The three-line version holds up to four 3" characters (including spaces) on line 1, up to eight 3" (including spaces) characters on line 2, and up to sixteen 1.25" characters (including spaces) on line 3. If you are purchasing a two-line sign, please leave the Line 3 input box empty. Like all Whitehall personalized address plaques, the Wisconsin address plaque is crafted from rust-free recycled aluminum. Colors: AB antique brass (shown in large picture), AC antique copper, BG black with gold characters, WG white with gold characters, OB oil rubbed bronze, OG bronze with gold characters, PS pewter with silver characters, GG green with gold characters, RG red with gold characters, BS black with silver characters, and BW black with white characters. We were excited to find a company that could make an address plaque for our Wisconsin address that has more digits than most. It came in a timely fashion and is beautiful. It gave the front of our home a fresh look and we love seeing it every day when we pull into our driveway.